In 1982, Ruth Shick Montgomery, former journalist and White House correspondent, donated money to The Texas Collection to set aside space for emerging mediums to be utilized. Today, there are thousands of cds, dvds, cassette tapes, vhs tapes, records, cd-roms, pneumatic tapes, as well as the equipment needed to view these materials in a newly redesigned space. There are also large flatbed scanners connected to computers for patrons to scan high resolution images of materials. 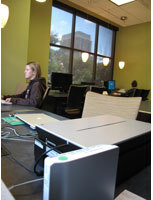 If a quick, medium resolution scan is desired, the patron can use the innovative KIC scanner. The staff here at The Texas Collection is willing to train patrons on the various pieces of equipment if they are not already familiar with them.